The Theatrical Biomechanics is the "traditional" system of theatrical education. The center of the system is the actor’s body, considered like a first expressive and creative mean, principal instrument of the communication. "Only when the body becomes malleable like a wax actor can express himself". The research work, that was made by Russian director with the actors, musicians, painters and architectures began with the practical study of the different traditional performances, from Kabuki Theatre to Traditional Chinese Theatre, from the Comedy of Art to Classic Ballet, from the Circus and the Theatre of the Fair to The Baroque Spanish theater. Understood like a way to pass the ideas of the artist to the public, the body should necessarily have always the proper form. 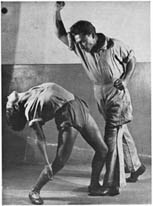 That is why the student, that studied the 7 principles of the construction of the action (the techniques) should exercise to develop the proper body expressiveness (the practice of the techniques). 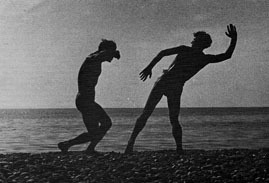 Meyerhold during the years had structured for his students about 150 stable physical exercises having the same subject, and called like in music, Etudes. The movements are codified forms, and are more difficult training for the actor because at the same time help the student to maintain alive techniques and the proper form in the space. In everyday live, when the theatrical system takes into account also the study of the form, this also gives the unambiguous interpretation. There are examples in all traditional Asian theatres and also Comedy of Art and in Classic ballet. Those pedagogies have a precise aim: to arrive to control the precise form, which is already known. The theatrical biomechanics doesn't give any stile. Historically the performance stile of Meyerhold, taking into account firstly the ideas of symbolism and than following futurism and constructivism, goes away from naturalism and realism of Stanislavski in order to use the expressive possibilities of Grotesque. Useful to express the artistic idea of the Russian director and to criticize with the proper peculiarity the habits of Russia before and during the Soviet Union, with the time refined and changed. The power of the method, like for the scientific theory, is in its universality and applicability for every type of stile and performance situation. 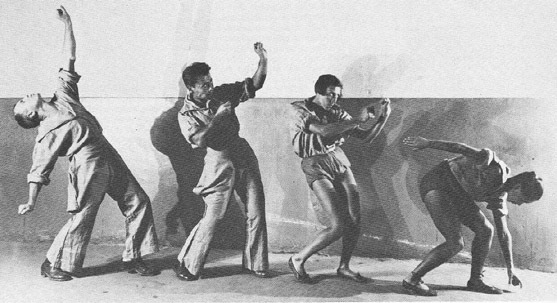 The research work of Meyerhold and the Theatrical Biomechanics was the starting point for the artistic research of the biggest artists of the theater of '900, from Jerzy Grotowski to Eugenio Barba, from Julian Beck to Tadeuz Kantor, from Peter Brook to Carmello Bene. From the first years Meyerhold didn't write in the books the results of his research work, like Stanislavski did, in order to prevent the possible wrong interpretations by the persons that had never taken part in his work. He admired the pedagogical traditions of the oriental theatres where the experience was orally transmitted from generation to generation, maintaining it alive and renewing the way of teaching but always protected from the multiplicity of interpretations and forcing. 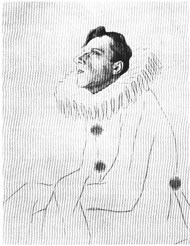 At the end of his live Meyerhold leaved his huge pedagogical inheritance to the unique person that was near him for 20 years, his collaborator and intelligent teacher Nikolaj Kustov. The Theatrical biomechanics in this way saved from the destruction of Stalinism was for more than 30 years kept and hidden from the world, developed inside closed theatrical laboratories in the provinces of the Soviet Union, and entered in a right moment. At 1972, always thanks to Nikolaj Kustov, it appears in Moscow, like a not obligatory subject for young actors at the company of Theatre of Satire. The heir of Master Kustov, Master Bogdanov, understood the fragility of this new theatrical pedagogical discipline. He did his best to make this subject return in live and to protect it from the influence of other more important institutes. At the first of '80 the Theatrical Biomechanics entered in the subjects of study in GITIS (State Academy of Moscow) and becomes famous in '90 in western countries thanks to a huge work of popularization and teaching of Master Bogdanov. In this new century the Theatrical Biomechanics of Meyerhold take the proper conscious of itself and of being a new tradition. Remaining the pedagogical system not well-known yet and a young tradition and still fragile, it is not in a danger of extinction anymore, thanks to the glamour that created its history and thanks to a small number of serious public and private structures of different parts of the world that are trying in a coordinated way to protect it. At the same time, exactly because of its charm it attracts the interest of some individuals, not correct, who without even knowing what is it, try to teach other people, basing on hypothesis, assonances and mistakes, risking at present, to deteriorate its fragile stability and at the end twist its contests. From those there were born terrible and gross misunderstandings that made from Theatrical Biomechanics of Meyerhold a simple body training or some type of the theatrical acrobatics. Someone taking into account the Etudes and the performances of Meyerhold created the stile, something between grotesque and marionette movement. These interpretations unfortunately have already created and are still creating dangerous mistakes and give different signification that the tradition has inside. Theatrical Biomechanics orients actor in all the phases of the proper performance life: from everyday training in order to comprehend and make alive the techniques to drama and composition. It doesn't say "what" the actor should do but make the actor ask himself a question "how" to do it. The continuous process of the actors work is to give the instrument and the form to the proper ideas.